Here at How To Adult, we want you to be equipped with the knowledge of both the positive and negative experiences that you’ll face in adulthood. That being said, there will definitely be instances where you’ll experience loss. This article in particular, focuses on the loss of family and friends. There are many cultural and religious practices that we might not know of, so here – we present to you the most common ones in Singapore. We note that this isn’t an exhaustive guide, but we hope that it’ll be useful for you, nonetheless. As we want to be as accurate as possible, please do let us know if we’ve missed out on anything important. As guests, we should always try our very best to be respectful towards the family of the deceased. A generic tip is to always dress simply and keep to neutral or dark colours. Do not attend a funeral in skimpy or sloppy clothes as it could be seen as disrespectful to the deceased and their family. This tip can and should be applied to a funeral for any race or religion in Singapore. What should you do at a funeral? When is the best time/day to visit? When someone passes on in a Muslim family, the deceased will typically be brought home and buried within 24 hours. This is to ensure that the process of decomposition is not seen on the body. The deceased will be bathed and wrapped in white cloth by selected relatives and in their own home. After which, prayers will commence either at home, or at a mosque. The deceased will then be carried in a coffin by close family and friends, and will be brought to Pusara Aman (the Muslim cemetery), where they will be buried. Once you’ve arrived, look for any of the family members that you might recognise and introduce yourself – but don’t be in the way as they might be busy preparing for the funeral and mourning the loss of the deceased. Muslim guests will usually join the prayers, while non-Muslim guests can wait outside the house, or sit and listen. You could also give a monetary contribution to the family of the deceased. There is no set amount, as it should be a gift – so give whatever you think is enough, and gift from the heart. An amount of $10 is perfectly acceptable, and is usually dependent on your relationship with the family. Place your contributions in an envelope, and leave the envelope with a family member of the deceased. You are not expected to stay throughout. Once you’ve paid your respects to the deceased and met the family, you are able to take your leave. As the family will usually charter a private bus to bring relatives and friends of the deceased to Pusara Aman, you could choose to follow them as well. WhatsApp and text messages are usually the mediums where friends and relatives spread the news of the death. We recommend paying respects and visiting the deceased at the house and at the time stated in the messages. It is important to note that you should not shake the hands of someone from the opposite gender, be respectful, and not talk or laugh too loud, especially when inside the house of the mourning family. The loss of an individual extends to the whole Muslim community as well – which is why you might find strangers or even passersby at the funeral. So don’t panic if you notice someone joining in as the prayers are going on. Unlike our Malay friends, there can be several religions living in a household for the Chinese. Hence, there might be several overlaps in terms of culture. Typically, the family will hold a wake for the deceased which will last for 3, 5 or 7 days. Odd number of days is a norm because even numbers are usually symbols of joyous occasions. Wakes are held at homes of the deceased, void decks or funeral parlours. If held at the void deck, a Buddhist or Taoist wake can be identified by the yellow tentage, whereas a Christian or Catholic wake can be identified by a white tentage. For Christians or Catholics, a funeral mass or service is conducted on the day of the cremation, which happens after the wake. This is typically only attended by family members. On arrival, you can greet the family and let them know that you would like to pay your respect to the deceased. You can view the casket if it is an open one. At a Buddhist or Taoist wake, you can light up a single joss-stick and give a bow to the deceased. It is also acceptable to bow three times without the joss-stick. At a Christian or Catholic wake, you can say a short prayer or some parting words to the deceased. Visitors who do not share the faith or close ties to the bereaved family are not obliged to conform to the rituals at the wake. Your presence is the best gift to the bereaved family regardless of religious differences. This applies across all of the religions – it is common practice for relatives and friends to make cash contributions to help the bereaved family with the cost of the funeral. A donation box is often present, if not you can hand it to a family representative or gift it in a white envelope. Be sure to write down your name and donation amount in a notebook next to the donation box or handed by the family member. The record keeping of donations is meant to help the family stay accountable for the money collected. Unlike Chinese weddings, there is no pressure on the amount you give. It really depends on how close you are to the family and their financial capacity. Friends could also gift sympathy wreaths and blankets to express their condolences. It is believed that there is nothing to be thankful for in an occasion like death. So family members will let you know that they appreciate the donation without saying ‘thank you’. You will often notice a plate of sweets, peanuts, melon seeds, and red thread on the table. The red thread is a respectful gesture from the bereaved family member to ward off the possible ‘bad luck’ that may be brought upon with the attendance of the funeral wake. Before you leave the wake, tie the red thread loosely around one of your fingers and let it slip off your finger before you reach home. Due to work commitments, friends will usually visit in the evening on weekdays, but it’s ideal to contact the bereaving family before you visit. The family members have to keep vigil throughout the night during the funeral period. If you are a close friend of the bereaving family, you will be doing them a great service by staying later into the night to keep them company and awake. Exercise caution and tact when conversing with the bereaved family. Steer away from questions that will cause emotional pain. It is acceptable to have laughter at the wake, or to talk about something else that’ll take their minds off the pain of losing a family member. Depending on the family, playing card games or mahjong are also acceptable at wakes, just be mindful to keep your volume down after 10.30pm for the neighbours. Visitors should leave quietly and not say ‘bye’ when you leave the wake. It is believed that ‘zai jian’ (see you again) could be taken as an invitation for the deceased to look for you. TBH, we are not too sure of this ourselves, but ‘bye bye’ is definitely something you should avoid saying at a funeral too. The body of the deceased will be brought for embalming and sent back to the home or funeral parlour. The body will rest for 2 – 3 days before the actual funeral, which is never held on Friday or Saturday, due to superstitions related to those days. Buses will usually be chartered to the crematorium, for those who wish to follow. There are several parts to a Hindu funeral. The first would be the open casket in the house. This is usually done 2 – 3 days before the crematorium process. You will first have to view the deceased when you arrive. Hindus consider them sacred now, and will touch their feet for blessings and offer flowers. The offering of the flowers are definitely more of a cultural thing – you could even offer them without reciting prayers. However, if you are not of the same faith, you are able to pay your respects without the ritual. After you’ve paid respects, you should then give your condolences to the family of the deceased. On the day of the cremation, the deceased will be brought down to the void deck or common area. This is mainly to allow for more family and friends to visit the deceased for the last time. This is also where some of the religious rituals will be held. There might even be strangers who attend the funeral, after hearing their personal stories on the news, or via social media. When the funeral processions are going on, allow relatives and close friends of the deceased to be closer to the body. After which, you have a choice of following the family to the crematorium. Buses will usually be chartered for those who wish to follow. There really is no hard rule for how much to give – as long as you give with the intention of helping the family cover the cost of the funeral. The best practice is to put the money in an envelope with wishes of condolences to the family, and your name. As it does take a huge toll on the family, you could even pool together with colleagues or friends, to give a more substantial amount. You could hand over the envelope directly to any family member you recognise, or find someone that’s the obvious ‘in-charge’ of the funeral. You should note that it is usually difficult to give money on the funeral day itself, as they might be busy with the funeral processions or just not have a bag with them. You can contact the immediate member of the family or keep a lookout on the newspapers – as an obituary will be posted with the date and time of the wake. It will also state the supposed time the hearse will leave for the crematorium, so it’ll be good to arrive 2 to 3 hours before that. As it will be extremely crowded then, it is advised to go a day or two before, to give your condolences to the family – and come back on the final day as well. If you are not able to make it to the funeral, you could also visit the deceased family a week or two after the funeral. Family members are usually prepared for visitors after the funeral as well. Similar to that of the Chinese-cultured funeral, you are not supposed to say ‘bye’. It is better to just leave with a hug. Hindus consider saying ‘bye’ as a way to let them know that you will be back for another funeral. 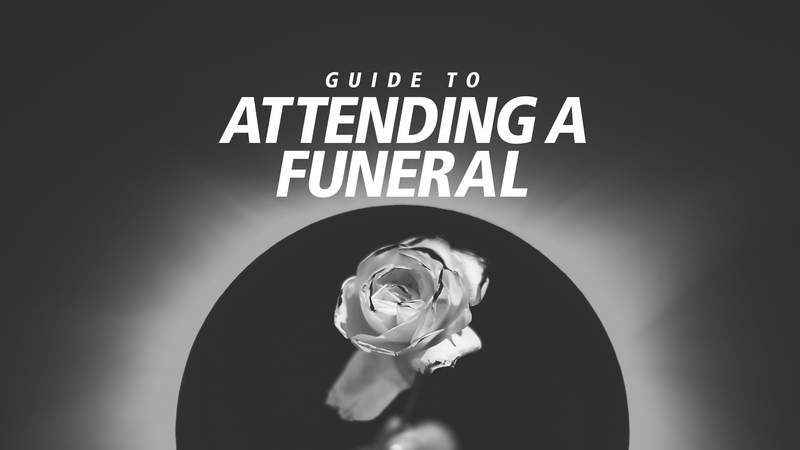 We understand how talk of death may be overwhelming for some, but a local guide to funeral etiquette has definitely been long overdue. If you were to have one takeaway, just remember to always be respectful and to dress appropriately. Once again, please excuse us if we’ve missed any important information – and do let us know if we should include it in this article.